John was a farmer in Lincoln Township. He died of acute dilation of his heart. He was 52 years, 11 months, and 15 days old and still married at his death. Florence worked at a hospital as a bookkeeper. She was 57 years old when she died. 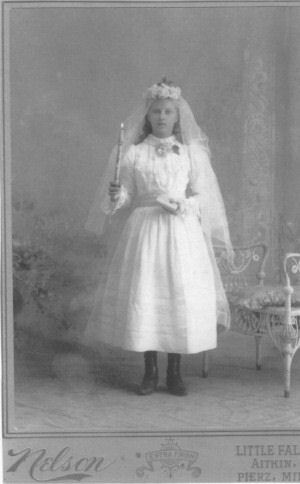 This picture was taken at her Confirmation at age 13 in 1898. Dorthea (Dora) was born January 25, 1885 in T. Muntz (Jamestown), Stutsman County, North Dakota. She married John Thomas Skroch on July 4, 1904 in Independence, Trempealeau County, WI at SS Peter & Paul Catholic Church. She died on January 24, 1948 and is buried in SS Peter & Paul Cemetery in Independence, Wisconsin. Detail: John Thomas Skroch Jr.